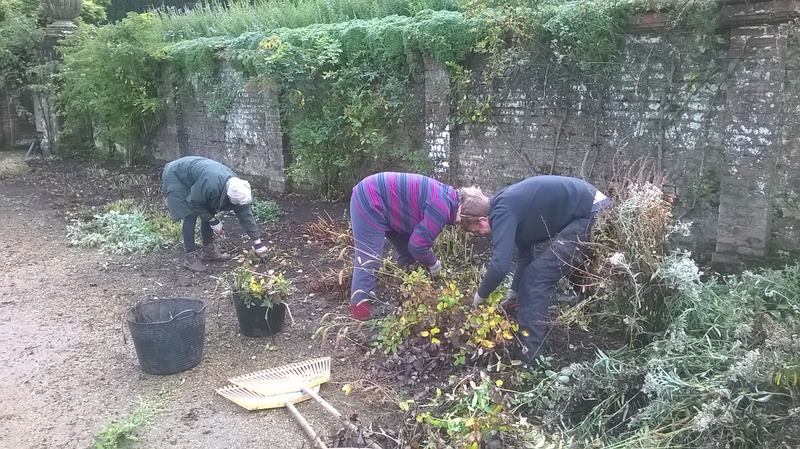 A rather dull, overcast day greeted we garden volunteers on our latest session at Blickling. The team was rather depleted, also, with a few people away on holidays. It was to be a day of ‘stalking’- cutting down the stems of the many herbaceous plants in the long border overlooking the parterre. It was also rather busy and noisier than usual; as it’s ‘half term’ here there were lots of families around walking the gardens and enjoying some community education activities in a tent by the lake. In the morning we continued the cutting and tidying process already begun the day before- we had about 7/8 of the border left. Apart from the occasional entanglement with the floppy stems of climbing roses, it was relatively straightforward; I dived into the borders and focused on cutting, with others doing this and collecting the cuttings and raking over the border to make it look tidy. 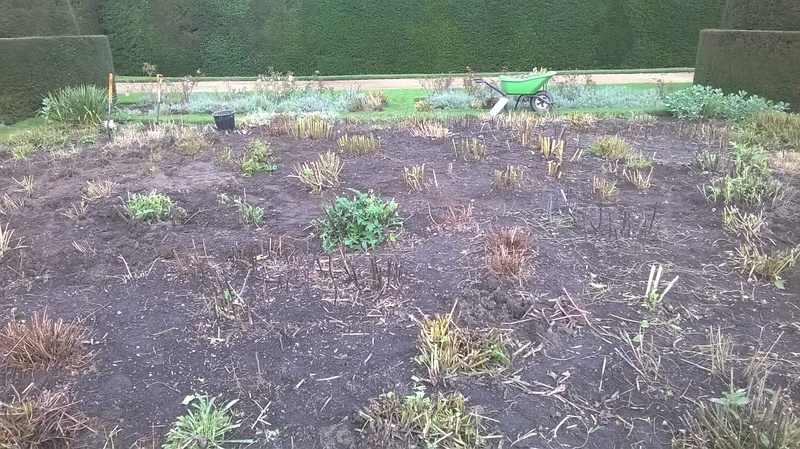 Once this is finished (the main parterre borders had already had the treatment), the borders will be lightly dug over and then mulched with compost to provide winter cover for the soil and help to feed the plants and improve soil texture. By the end of the session we had virtuially completed the whole border- and produced several truck loads of cuttings which will be shredded and added to the Hall’s large compost heaps. 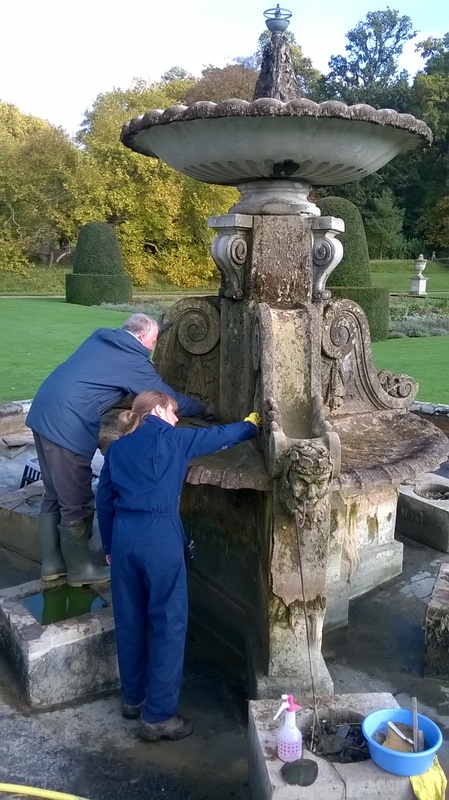 Towards the end of the morning I took a break and ‘stalked’ two people from the house and collections team who were cleaning the fountain in the middle of the parterre. They were using toothbrushes, water sprayers and hands to peel away quite a bit of muck, accumulated over a few years. It was interesting to see how the definition of the stonework dramatically improved as they worked their way across its surface. It looks like the basic structure is, in the main, pretty good, but it is also clear that there are some areas in need of repair. From here I ‘stalked’ Assistant Head Gardener, Steve, who was painstakingly digging over one of the four parterre borders; to both split some of the bigger herbaceous plants and at the same time try to remove bindweed which seems to be a long term problem here. Steve was sanguine about the weed returning, but he was spacing out the plants so that it would be relatively easy to get in the border to remove it when it does return. The way to the Hall…the heated liquid will be pumped to the bolier room along pipes to be laid in this trench and a heat exchanger will turn it into hot water for the Hall. We talked about the new heating system being installed at Blickling, which you may have heard about. This is based on a water source heat pump which acts rather like a fridge in reverse- a coolant fluid is pumped into a long series of plastic pipes which are sunk into the lake and these are connected to a pump which draws in the warmed fluid and a heat exchanger in the house transfers this to the hot water system. Apparently there’s a gas back up boiler also being put in to cope with especially cold weather. This is set to reduce the £30,000 per annum fuel bill the Trust currently pays out for heating. Here’s a short video clip about the project. After lunch my final ‘stalk’ was over to the Bug Village I had been working on last week, but was sorry to hear that gardener Ed -whose project this is- had seriously damaged his back trying to lift some of the large pieces of trunk he was installing in the new area- I wish him well soon. The ‘Bug Village’ is starting to take shape nicely with several up turned stumps put in place and some further woven hazel fencing along with the large chunk that will provide a lovely seat back…in due course.